The roots of a plant or tree feed the vegetation and keep it growing. When you discover an unwanted plant in your yard, you need a fast and effective way to kill it. Killing the roots of the plant is a simple way to ensure that you kill the plant and permanently eliminate it. Without the roots delivering food and water to the rest of the plant, it slowly dies. Killing the roots will kill both plants and trees of different types. You must first locate the roots of the plant. Dig around the base of the plant or tree, exposing the roots. Dig a trench around the roots with a shovel. This keeps treatment confined to the roots you wish to kill and prevents treatments from affecting other plants. Cover the roots with salt. 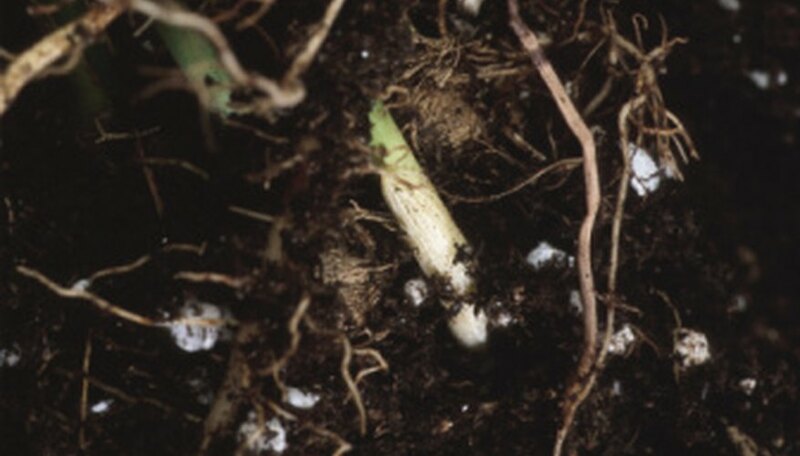 Salt will kill almost anything it comes into contact with, including the plant roots. Apply more salt after every rain because rain transforms the salt into harmless saltwater and will prevent the salt from working effectively. Coat the roots of the tree or plant with herbicide. Spraying the herbicide on the roots causes the plant to absorb the herbicide and spread it through the rest of the plant. Pour mulch over the top of the roots. Mulch essentially suffocates the roots of the plant by blocking the roots from obtaining the nutrients the plant needs for survival. Drown the roots with water. Keep pouring water on the roots until you thoroughly saturate the surrounding ground and the water pools in the bottom of the hole. Plants and trees need water to survive, but too much water will kill them. Consider cutting into the roots of the plant, chopping off the ends. The exposed ends absorb more of your treatment.